We have created a new repository on the CreateJS GitHub site where we plan on sharing code, classes, and demos that don’t quite belong in the library repositories. Check out the “Sandbox” repository here! Bitmap Text: Use an SpriteSheet as a source for a bitmap font. EaselJS & Box2dWeb: A demo showing how to integrate the Box2dWeb physics engine with EaselJS graphics & SoundJS audio. Kaleidoscope: Easily draw configurable kaleidoscopes using any DisplayObject as a source in EaselJS. Line Graph: A very simple line graph example. 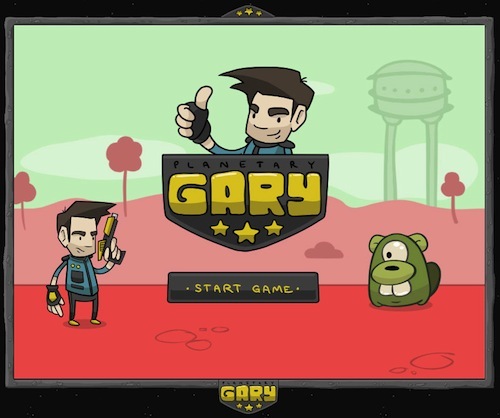 Planetary Gary: A full featured CreateJS game example. Toolkit for CreateJS Banner Ad: Interactive HTML5 banner ad created entirely in Adobe Flash Pro with Toolkit for CreateJS v1.2. E-Learning Lever: An example of embedding a CreateJS-based interactive learning piece into a larger document. Our plan is to continue to release cool demos and experiments here as we build them. Please feel free to use code samples, but check out the license information in the accompanying readme files. CreateJS Update: New Libraries Available! →← CreateJS + Super Slot Cars = fun times! Demos and examples in a Git repo would be handy. EaselJS looks pretty sweet. One thing I find I want desperately is for EaselJS to be available as a bower package.